Picross 3D could be the most entertaining logic puzzle game you've never heard of, and it has the full backing of Nintendo. Picross is a puzzle game series that, unbeknownst to many gamers, Nintendo has put its muscle behind all the way back to the days of the original Game Boy's Mario's Picross. It was most recently brought back to the Nintendo DS with Picross DS, an incredibly deep and brain-bending experience that sucked away many hours of my life. Picross is a logic game that uses nonograms, standard grids of squares, say 10x10 or 15x15, with numbers around the outside of each grid row that tell the player which squares must be filled in and which must remain blank. Once all of the squares are filled in, their combination displays a usually somewhat abstract image of an object. So, in Picross, you're not just solving a challenging logic puzzle, you're also making cute pictures appear. Nintendo's latest Picross project is Picross 3D, coming to the DS in May, which creatively brings the nonogram into the third dimension. Now, players chip away at a 3D block made of cubes, trying to determine which cubes must remain to form an object such as a puppy face or cellphone, rather than filling in squares on a 2D grid. Nintendo was kind enough to bring Picross 3D to PAX East 2010, and being a fan of puzzle games and the use of logic in relation to such, I took some time to sit down on the bouncy mushroom-like chairs of Nintendo's booth to check it out. And yes, the chairs were pretty awesome. Picross fans will easily understand the idea behind Picross 3D. 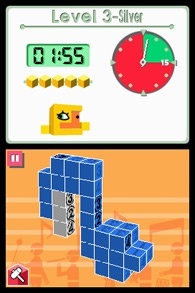 Players can still mark cubes that should be kept with a paintbrush, very important to the basic logic required to solve Picross' puzzles, but now use a hammer to break those that need to be destroyed instead of a pencil to fill in squares. The controls are very simple to get the hang of, using the stylus to rotate the puzzle block around and to see inside of it to mark cubes hidden from the outside. However, the transference of the game to 3D adds a completely new aspect to the logic required to solve each puzzle. Each row of cubes now becomes its own little challenge, with certain rows marked on the edges as having 8 cubes in a row or 6 cubes that have at least one break in-between. The basics are the same as Picross, but the challenge is not. Like any logic game, it takes time to discover solving techniques, but even in my short playtime I began to do so. One involved spinning the block like a maniac when I just couldn't figure out what to do. As my brain made adjustments from 2D to 3D, I began to understand the third dimension. Even for Picross veterans, Picross 3D will likely feel like something new at first, as it did for me. Brand new players should remember that this is a game fully backed by Nintendo, so it eases players into the deeper parts of the game expertly. The strangest part of Picross is how rewarding it feels to finish a brain-crushing logic puzzle only to display a cute little fish. It's as if a fairy were to kiss you every time you got rid of four lines in Tetris. This odd sense of accomplishment is one of Picross' draws, and it continues, but on a different level due to the display of a 3D object in Picross 3D. From my impression at PAX East, it's a cute, fun, logic puzzle game that will make smoke come out of your ears and then make it all better by showing you a tulip.